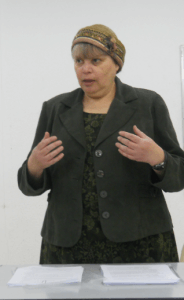 IYIM’s director of the Agunah and Get-Refusal Prevention Project, Dr. Rachel Levmore, lectured in Kibbutz Lavi of the Galilee. The lecture’s title was: “Stories of your Neighbors as Victims of Get-Refusal: How Prenuptial Agreements are a Preventative Solution”. The crowd that gathered to hear the presentation was fascinated by the stories told about women from their own communities, and thus became very receptive to the need to assure that every marrying couple signs the Agreement for Mutual Respect as a preventative measure warding off get-refusal for either spouse.